I’m tired, and I don’t know where to start. Perhaps, I should do what I would advise others do: Just start. Just say something. You see, for a deliberate, throwing something dirty all over the page is plain torture, if we’re even lucky enough to conjure anything at all! But, since I’m writing for you, Sharon, and for you, Linda, and you, Laura, and each of all of you, I’ll submit myself to the torture, I mean, the process. The day for me began two and a half hours after yesterday ended. . . . See? I don’t know where I’m going! Argh! I stuttered, I spit, and I stopped. Starting . . . Again. I posted in the My 500 Words facebook group that I was going to attempt today’s 500 in “the next 45 minutes.” That was nearly two hours ago. I spent 43 of those first minutes surfing, scanning, hoping for inspiration, digging for a glimpse of something that might actually sprout life. I looked at old workshop notes, I opened a couple of quote pages, a few song titles even clicked through my mind. Still, nothing. Why did I spin those 43 minutes into oblivion? I didn’t know what I wanted to say. I needed a trigger, a flash of light, if you will, to shine not just on a single word, but to swing out and show me the direction of the path that word would take. I saw so many possibilities, the individual flashes turned into one long blur. This whole writing every day thing could land me in the loony bin. Just sayin’. I’ve been a clue kid my whole life. My parents and friends used to put me on the spot at various parties or family functions. “Sing something for us, Robin.” I’d meet their hopeful eyes with blank stares. Never could I pull a song from my pocket. Ever. It didn’t take long to learn I needed help. I started asking them to give me a letter or a clue. A decent percentage of the time, this mad method actually worked. Are you going to Scarborough fair? Parsley, sage, rosemary and thyme. Remember me to the one who lives there. She once was a true love of mine. For the record, that was real time. I haven’t listened to or heard that Simon and Garfunkel classic since the seventies. Odd, huh? Well, odder still, that’s the only line I know. But that’s how this game went. I rarely presented entire songs when we played. My friends enjoyed the challenge, as did I. But they also enjoyed the tease, ribbing me for being the “queen” of one-liners. “Stanley, can’t you ever remember a whole song?” Well, actually, no. I hated it. Hate. Ed. It. Occasionally, I suppose, I’d remember a whole song here or there, usually hymns or nursery rhymes—pieces that were sewn into the fabric of my being, not just pop songs. Growing up, I listened a lot to the radio as background noise. So, it’s no wonder only flashes of songs stuck, as groups like Chicago, Grand Funk Railroad, Blue Swede (“Ouga, chaka, ouga, chaka. I can’t stop this feeling . . .”), Chaka Kahn (Who is THAT?) performed their static duty. Sheesh. Our minds really are storehouses of information, even junk that barely seems to pass through resurfaces decades after the blip of an encounter. And, guess what? If I hadn’t just started writing, they would have been dormant another thirty years. Association does wonders, doesn’t it? It’s almost as if the light of each word illumines the next, revealing the direction of the path a step at a time. Go figure. One afternoon, a friend pleaded. “Robin, my mom loves your voice. It would mean the world to her if you’d sing something.” I crossed my fingers and surrendered control. After all, we were at a party celebrating her mom’s special birthday. “That ‘Friends’ song is one of her favorites. You know the one, by Michael W. Smith?” (Have I aged myself yet?) Being the girl who doesn’t want to disappoint anyone, I said “yes.” Then I made my friend sit with me to scribble the lyrics onto a napkin. I sang the song. A cappella. All of it—at least all of what was on the napkin. My friend and her mom cried. Because I performed perfectly? Nope. It touched them because I offered what I had, my heart, a gift. Pure and simple. And it was enough. Fear holds us back, doesn’t it? Me and you? We wrestle, we scuffle, we stand headstrong, insisting we would massacre the song, cause the clay to flop, streak the watercolor gray, bend the beam backward, tumble off the stage, spit too much, speak too little, create a tremor, bore our readers, draw a blank, disappoint, fizzle, flop, fail . . . fall . . . on our faces, on the ice, into oblivion. Unseen, unnoticed, unappreciated. If I can give the gift of a song to fill the heart of a dear friend’s mom, scribbled out, torn up, somewhat pitchy, raw, I can dare hold out my hands to offer the gift of a word. A string of words. A life-giving sentence, maybe two, dare I allow more—to flip, to spin, to color the world bright, to dance, to speak, to still, to engage, to fill a page, to inspire, to fulfill . . . to fall . . . on our faces, on the floor, in worship. Abandoned. Aware. Forgiven. Free. 132 minutes, minus 43, equals 89. 89 minutes to write nearly 1000 words. Not garbage words. Words that give life, even perpetuate it, or bear fruit, if you will. Because I started. From scratch. No preconceived notion . . . eventually. In order to bear life, I must first give up my life. Die to it. Leave myself out of it. 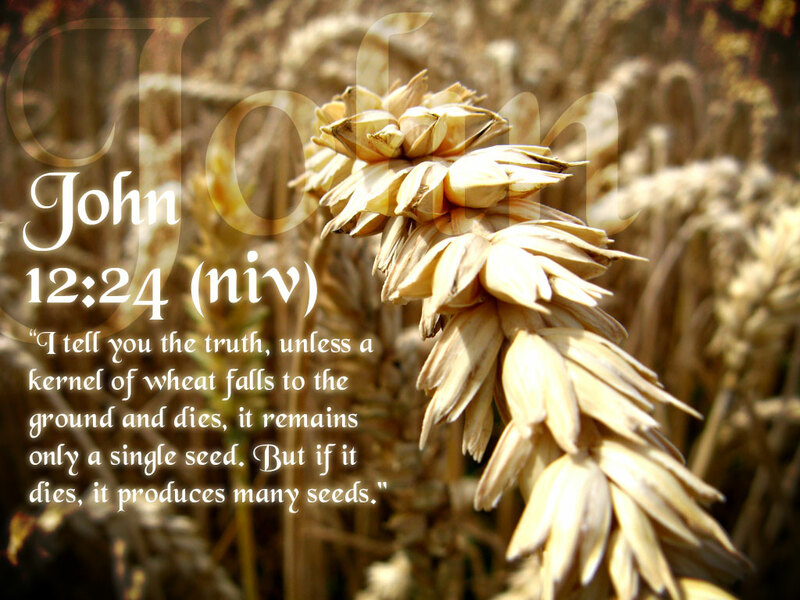 Humbly bow to the ground, unclench my fists, and let the seed grow. So, too, must you, if you are to bear the life you’re meant to give. Join me in this 31-day life-giving death as I write My 500 Words every day with Jeff Goins and a thousand other people. I’m doing it for you. Will you come? Sit? Read? Worship? Edify? Invite someone you know? Become the life-giver you were born to be? Leave a comment, if you will. Participate here. You’re seen. You’re safe. You’re loved. This is great, Robin. Putting yourself out there in order to give whatever talent you have–wonderful. Allowing God to use your willingness to bless others. I remember God showing me something about a dustbunny under my dresser. How random and simple, but God used my moment of cleaning. I did not expect that. As I grow as a person and as a writer, I should not be surprised when He does that. Thanks for sharing. I’ll pass this along to my writers group. Hi Evelyn! He shows up with more to say than we realize, doesn’t He? A dust bunny? How creative! Thanks for sharing this with your group. Glad to connect! Ugh. Robin. I relate to this more than you know. I’m fearful, tired, empty, my pen dry. But your post inspires me. I’m leaving this comment, then going to the blank page to spill something onto it. 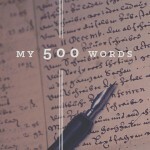 It’s going to be ugly, most likely, but it will be words toward my goal of 500. Thanks for pushing and inspiring me. We can do this. Yep, we can. Do. This. Saying “yes,” with your “yes”! NICE!!! Back in my court, eh? 😉 Starting now! No plan yet. I’m such a night owl. Determined, though! This feels right. Really, really right.